Today is the anniversary of one of the greatest photos ever taken. On February 14th, 1990, as the Voyager 1 space probe was leaving the solar system, having completed its primary mission, astronomer Carl Sagan requested that it turn around and take one last photograph of our distant home. NASA complied. 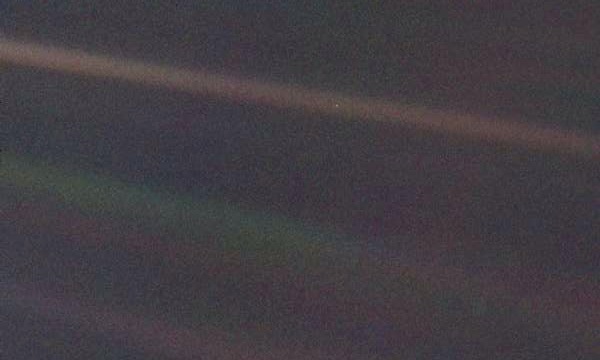 In the photo, taken from a record distance of 3.7 billion miles, Earth appears as a tiny, insignificant dot, suspended in a band of sunlight, all but lost against the vastness of space. In his 1994 book Pale Blue Dot: A Vision of the Human Future in Space, Sagan poetically reflects on the deeper meaning of this powerful image. “We are a way for the cosmos to know itself”. That’s a very interesting take. 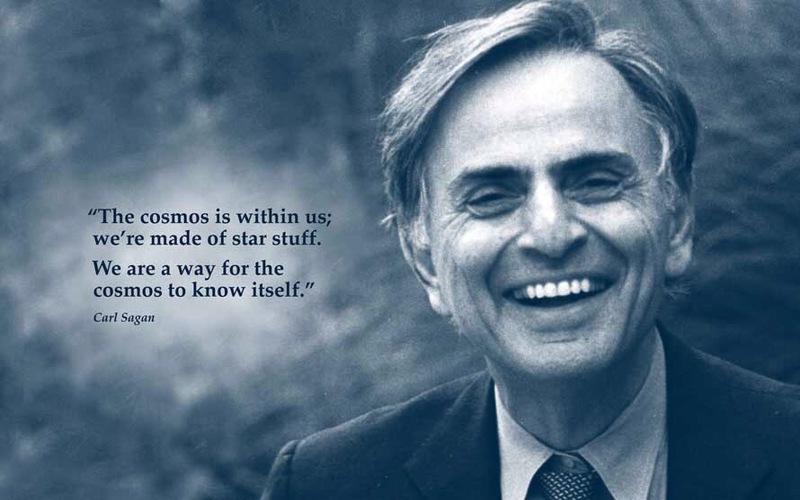 By the inclusion of “cosmotic” stuff (like it or not that’s a word now, and not far from cosmetic) Sagan concludes our right of ascension into it. We can move into it with such knowing granted us in “our stuff” being of “its stuff”. On its face it sounds most reasonable but we needn’t tarry long to discover there’s already (if the reasoning is sound) a distinction not subtle at all, we “got the knowing stuff” moving into “a stuff” quite different. We have already set a dichotomy in “our” stuff, “its” stuff. We do indeed have knowledge of possession. The knowledge…of possession of knowledge. You may not like the reasoning and perceptions (thinking yourself far wiser) than my 4 year old great grandson, but already he can tell me the difference between himself and a rock. And that, of course, needn’t at all be sufficient for you. You are free to tell him about minerals in rock, and minerals within himself being same. Free to expound on all the similarities and seeming sameness, move even to physics and philosophy of occupation of space moving through time. Expound on “laws of matter” and energy to bedazzle him with a fundamental assertion he may not receive (unless he gets bedazzled) “You and the rock are just the same”. Now, if that is your assertion, then I am merely speaking to stones. And it would be vain, if that were likewise my assertion, to continue. And again you’d have the right and freedom to both conclude and say of me “that is one very vain stone”. Because I am…continuing. And in great part because I do side with my great grandson. We agree to “know something” in the sharing of knowledge. Where this knowing to agreement will part ways is yet to the knowing. I have little doubt it will, at some time, in some way (actually it already has in myriad ways) show itself more plainly. Agreement is fundamental (and likely the definition of it) to any shared knowing, and he already knows on some fundamental level, I am not as fascinated by a Spiderman toy as he is. So, already there is a difference in “his stuff” of knowing, and my own. But, I also think he knows he is not to be, nor expects to be, kicked like a rock from my driveway. This “knowing stuff” (of which we are, in noun) and participate (of which we do, verb-ally) we “do” even within ourselves, and outwardly toward one another. We tell ourselves “we know”…and then proceed (sometimes like this, tapping keys) to make known…what we know. And it is surely well beyond both my right and ability to dissuade or persuade any from a conviction they are no more, nor less than a rock, on a rock, flying through space interspersed with various other forms of rock and gasses colliding and caroming senselessly. But here then is your conundrum, rock. If there be no sense “in the universe”, no reason “to it”, at all, but you are using your reasoning in attempt to discern my key tapping, and even if only there, only in one, only in YOU, you find reason…then reason exists…in the universe. And you, now, would be the quite vain rock to imagine it only exists there, no? How many of you laugh, as I once did, at the apparently benighted goat herders, in all their primitive ignorance, seeming superstition, and grossest of presumptions to record their now laughable knowledge? Man and dust (rock!) are the same…until…something knowing breathes knowing into it. You are a soul, a living one…and being fascinated by stuff, and things (even Spiderman toys) is truly not your chiefest end. Rocks can only yield so much of their being in their telling, but seeking, and finding the source of knowing that breathed His knowing into dust is all you were made to relate to. And through. Of course you may disagree, its your perfect right to be different. And in that, we are precisely, the same. And right, and rights, come “from something”.